My last guests wrote a lovely review on Airbnb, and mentioned how nice it was to see wildlife both around the property and even right from the Cordwood Cabin they were staying in. Wild Turkeys, in particular, have been common sightings this time of year. For size perspective, the well head seen mid-right protrudes 2 feet above ground. These pictures were taken from my front porch the following weekend. 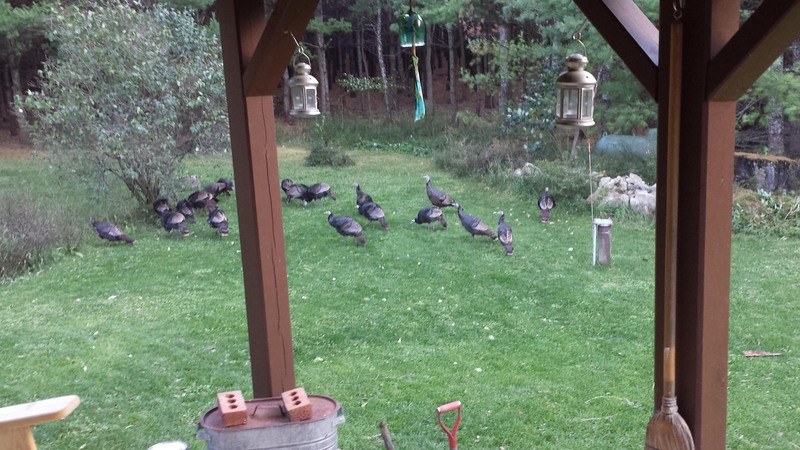 They move quietly, in their large social groups, to the point that if you happen to be sitting quietly and still reading a book you may suddenly look up and, uh, there is flock of turkeys there!! If you happened to have been reading Hitchcock’s The Birds it might be slightly disconcerting at first but on closer inspection they are pretty and, despite their imposing size, generally docile animals. Wild Turkeys are the only North American animal that has been widely domesticated; all others (chickens, pigs, cattle, horses, etc) all came from other continents. Wild Turkeys can fly (in fact they will roost in trees at night) but their real feat is using their feet… they can run up to 30 km/h, it’s quite a sight! 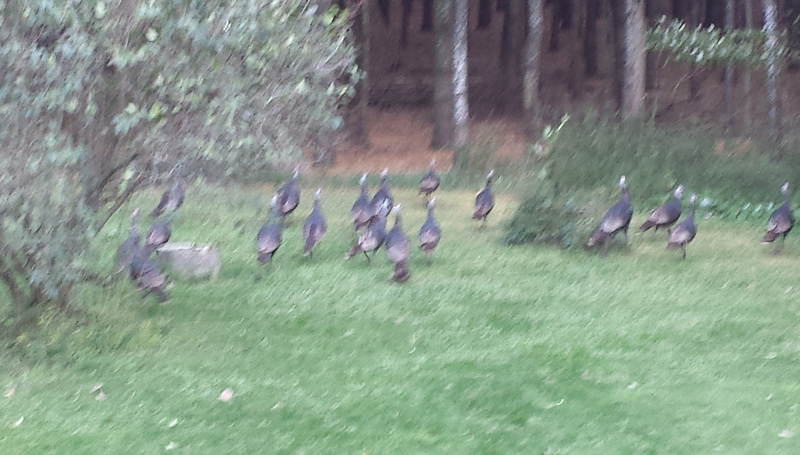 A blurry zoomed image as they sense my presence and made a run for it!